The responsibilities of Inventory Control Analyst are to maintain a record of available inventory, make the goods available as per the sales demand, estimate the production demand, schedule the shipment of orders, and regulate the inventory costs. They should have complete control over the supply chain of the organization. Skills required to accomplish the listed tasks are critical thinking skills, communication skills, organizational skills, and problem-solving skills. Are you good at keeping track of things? 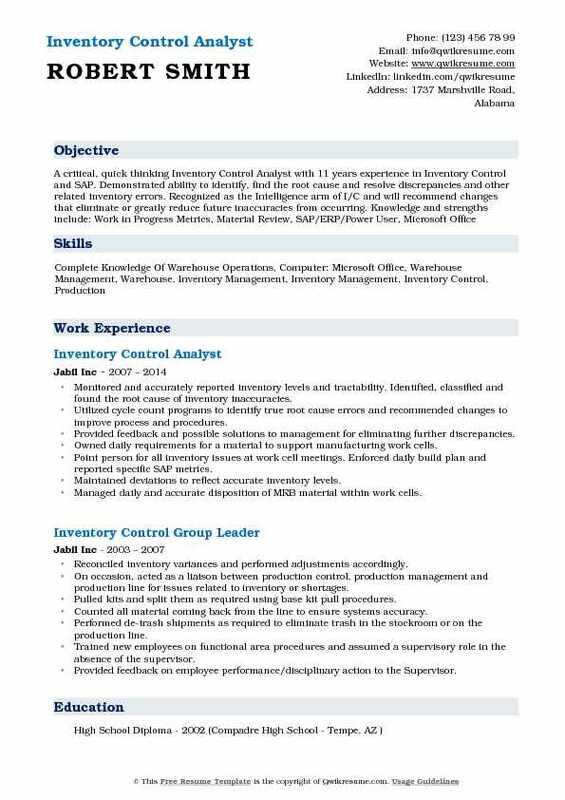 Then, the role of Inventory Control Analyst is one of the career options to consider. 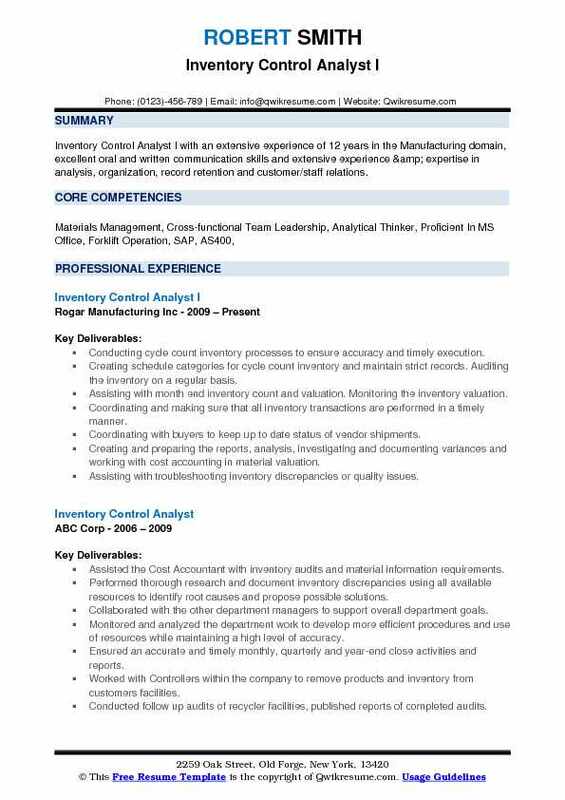 To become an Inventory Control Analyst it is essential to have a bachelor’s degree and a perfect Inventory Control Analyst Resume sample that speaks completely about you. A degree in supply chain management or business systems would be an added advantage. 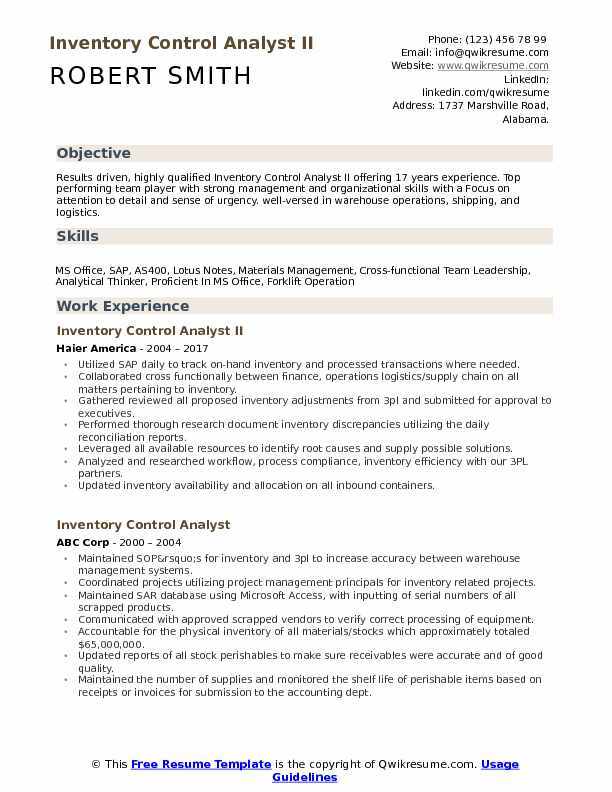 Summary : Results driven, highly qualified Inventory Control Analyst II offering 17 years experience. Top performing team player with strong management and organizational skills with a Focus on attention to detail and sense of urgency. well-versed in warehouse operations, shipping, and logistics. Utilized SAP daily to track on-hand inventory and processed transactions where needed. Collaborated cross functionally between finance, operations logistics/supply chain on all matters pertaining to inventory. Gathered reviewed all proposed inventory adjustments from 3pl and submitted for approval to executives. Performed thorough research document inventory discrepancies utilizing the daily reconciliation reports. Leveraged all available resources to identify root causes and supply possible solutions. Analyzed and researched workflow, process compliance, inventory efficiency with our 3PL partners. Updated inventory availability and allocation on all inbound containers. Conducted audits and request cycle counts for inventory within each of our eight warehouses. Managed all inventory related activities to ensure the integrity and accuracy of company assets. 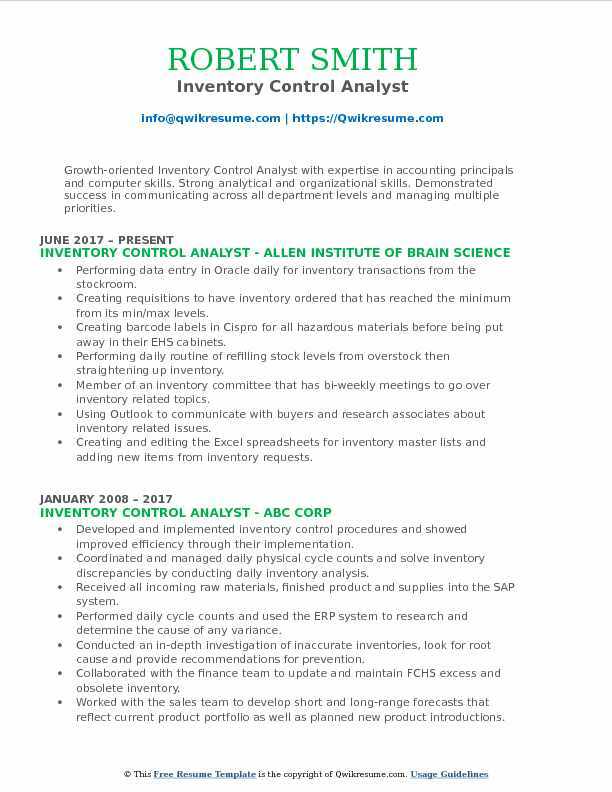 Summary : Inventory Control Analyst I with an extensive experience of 12 years in the Manufacturing domain, excellent oral and written communication skills and extensive experience & expertise in analysis, organization, record retention and customer/staff relations. Conducting cycle count inventory processes to ensure accuracy and timely execution. Creating schedule categories for cycle count inventory and maintain strict records. Auditing the inventory on a regular basis. Assisting with month end inventory count and valuation. Monitoring the inventory valuation. Coordinating and making sure that all inventory transactions are performed in a timely manner. Coordinating with buyers to keep up to date status of vendor shipments. Creating and preparing the reports, analysis, investigating and documenting variances and working with cost accounting in material valuation. Assisting with troubleshooting inventory discrepancies or quality issues. Working with warehouse personnel with their manuals, procedures and process improvements. Monitoring the warehouse/stores transactions for timely processing, accuracy, and cost-effectiveness. 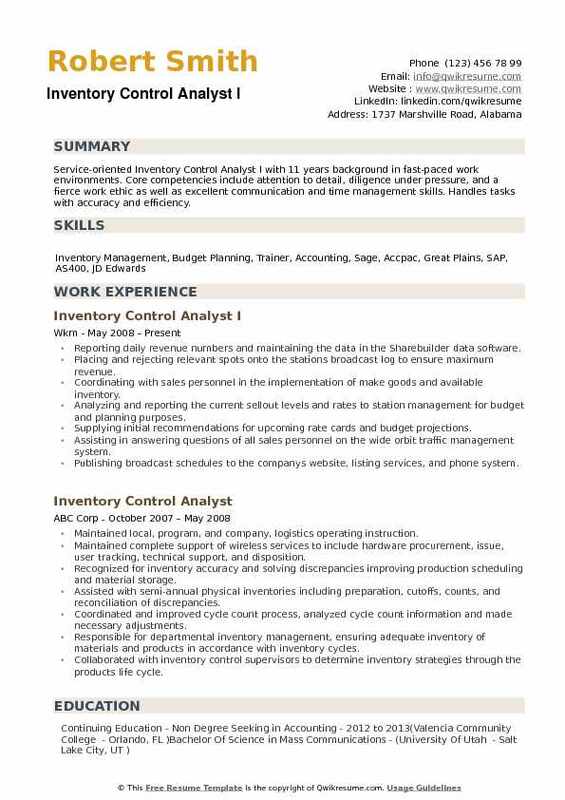 Headline : Experienced Inventory Control Analyst with progressive experience of 6 years in areas of logistics, asset management, inventory management, discrepancy resolution, and receipt and distribution. Demonstrated ability to lead effective teams in customer relations as well as developing effective logistics governance strategies. Exceptional interpersonal, communication, and relationship building skills. Assisting in supervising the warehouse operations team in the receipt and distribution of goods to multiple facilities including grocery stores, convenience stores, and restaurants. Conducting driver check-in to verify any and all goods returned and confirm inclusion back into inventory. Running daily order report detailing customer orders and compare to what was pulled from inventory to fulfill the request. Identifying discrepancies in the shipments as related to what was requested and report to management. Running daily shortage report detailing the inventory prior to order fulfillment to verify if discrepancies were based on lack of physical inventory or failure to pull correct items from inventory. Issuing the credit back to the customer when items were shorted on the order and when items were back-ordered. Transferring fresh products to the frozen section once the fresh shelf life has expired and document all transfers to and from the frozen section for management. Conducting quarterly physical inventory counts to 100 percent completion ensuring that discrepancies greater than five units are reviewed and resolved. Headline : Skilled Inventory Control Analyst well-versed in warehouse operations, shipping, and logistics. Exceptional organizational skills and strong attention to detail. Experience in creating and implementing process improvement strategy plans, documenting Operational Goals and Objectives, and developing training strategies for new employees. Skills : Microsoft Office Word, Excel And Access, PowerPoint, Outlook Mail, MRP, AS400, EAM Purchasing Systems. Developing and maintaining the accurate cycle count/audit documentation and reports including necessary inventory adjustments. Communicating daily and monthly results of cycle count to the upper-level site. Implementing and promoting continuous improvement in the customer supply. Understanding and meeting all quality goals. Providing direction and coordination to coach, support team, and trainer for warehouse members. Monitoring the standard work instructions for potential revisions, making a recommendation. Preparing, presenting, and participating in the yearly interior and exterior financial audits conducted by corporate. Developing, implementing, and overseeing the year-end inventory count assignment of all production lines in plant 2. Identifying overstocks and make recommendations for both book and web clearance, and in season web promotions. Adjusting retails to improve the sell down of overstock inventory. Summary : Inventory Control Analyst III with over 18 years of successfully conducting strategic planning, project management, data analysis, inventory and purchasing management and measuring the success of project efforts to ensure high ROI. Strong comprehension of quantitative skills and ROI analysis. Decreased, distressed unproductive inventory which increased total inventory turnover. Minimized stock loss and damages to about 80% below company limit using my analytic skills. Provided daily inventory status reports to salesforce and supply chain. Supported/participated in process improvements to meet company goals. Ensured positive communications with team members to verify variance sources. Provided quality leadership to assigned team to meet developmental needs. Audited receipts, bill of lading, invoices, and purchase orders for accuracy. Performed cycle count manually and with scanners on-site and off-site. Ensured product/raw material rotation by reporting close dated products. Verified product shelf life and disposed of out of date in SAP system. Reviewed stated produced quantity and sales report to match inventory reports. Analyzed stock to report and provide recommendations on backorders, cancelations, and lost demand. Monitored and accurately reported inventory levels and tractability. Identified, classified and found the root cause of inventory inaccuracies. Utilized cycle count programs to identify true root cause errors and recommended changes to improve process and procedures. Provided feedback and possible solutions to management for eliminating further discrepancies. Owned daily requirements for a material to support manufacturing work cells. Point person for all inventory issues at work cell meetings. Enforced daily build plan and reported specific SAP metrics. Maintained deviations to reflect accurate inventory levels. Managed daily and accurate disposition of MRB material within work cells. Accurately located and contained all relevant material involved in the purge process that was suspected to be non-conforming. Ensured expedite of material when needed. Accurately received and distributed material into the plant. 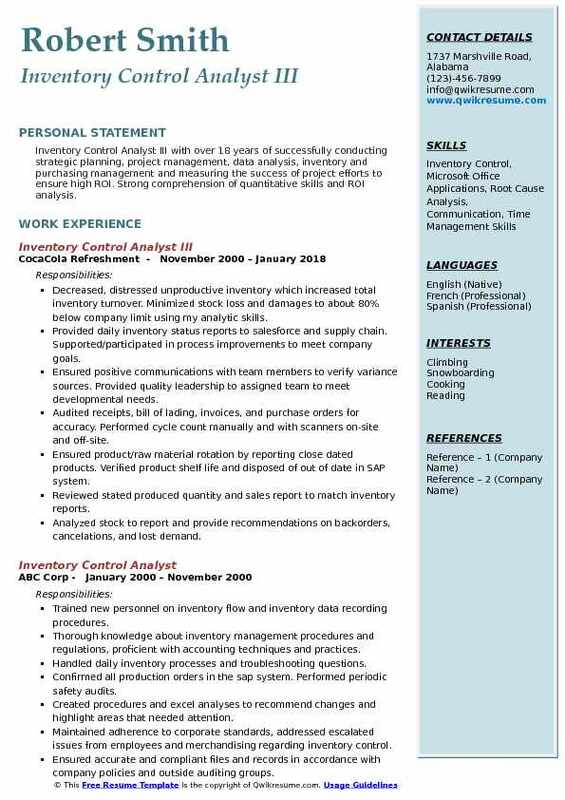 Summary : Growth-oriented Inventory Control Analyst with expertise in accounting principals and computer skills. Strong analytical and organizational skills. Demonstrated success in communicating across all department levels and managing multiple priorities. Performing data entry in Oracle daily for inventory transactions from the stockroom. Creating requisitions to have inventory ordered that has reached the minimum from its min/max levels. Creating barcode labels in Cispro for all hazardous materials before being put away in their EHS cabinets. Performing daily routine of refilling stock levels from overstock then straightening up inventory. Member of an inventory committee that has bi-weekly meetings to go over inventory related topics. Using Outlook to communicate with buyers and research associates about inventory related issues. Creating and editing the Excel spreadsheets for inventory master lists and adding new items from inventory requests. Managing inventory requests from service now then closing them when complete. Participating in the bi-weekly meetings with the Senior Buyer to go over inventory and purchasing issues. Adding all new items to inventory using Excel and creating bin locations in the stockroom. 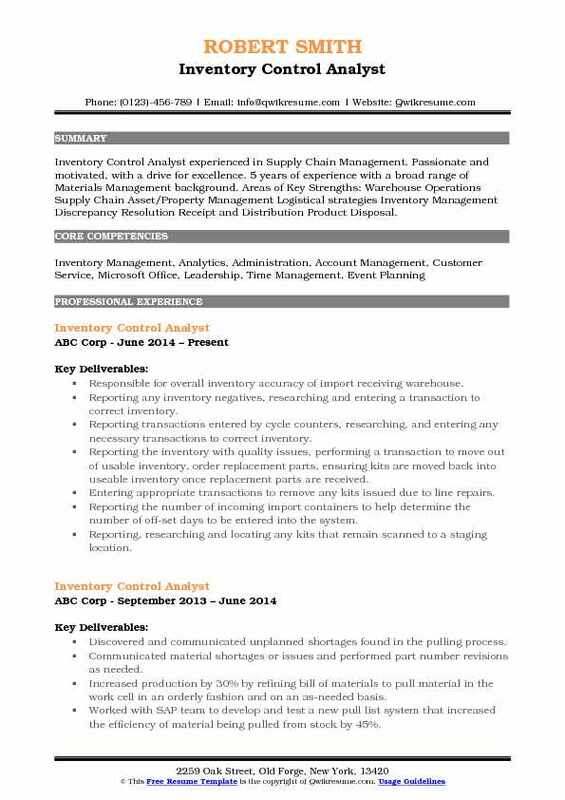 Headline : Inventory Control Analyst experienced in Supply Chain Management. Passionate and motivated, with a drive for excellence. 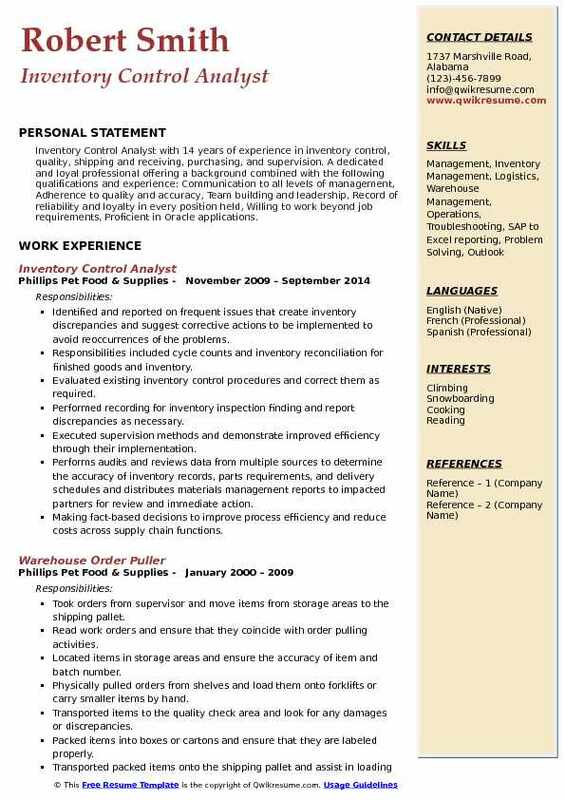 5 years of experience with a broad range of Materials Management background. Areas of Key Strengths: Warehouse Operations Supply Chain Asset/Property Management Logistical strategies Inventory Management Discrepancy Resolution Receipt and Distribution Product Disposal. Responsible for overall inventory accuracy of import receiving warehouse. Reporting any inventory negatives, researching and entering a transaction to correct inventory. Reporting transactions entered by cycle counters, researching, and entering any necessary transactions to correct inventory. Reporting the inventory with quality issues, performing a transaction to move out of usable inventory, order replacement parts, ensuring kits are moved back into useable inventory once replacement parts are received. Entering appropriate transactions to remove any kits issued due to line repairs. Reporting the number of incoming import containers to help determine the number of off-set days to be entered into the system. Reporting, researching and locating any kits that remain scanned to a staging location. Reporting total dollar totals of any kits issued due to production deviations. Communicating to sales, management, and supervisors about the quality of the product. 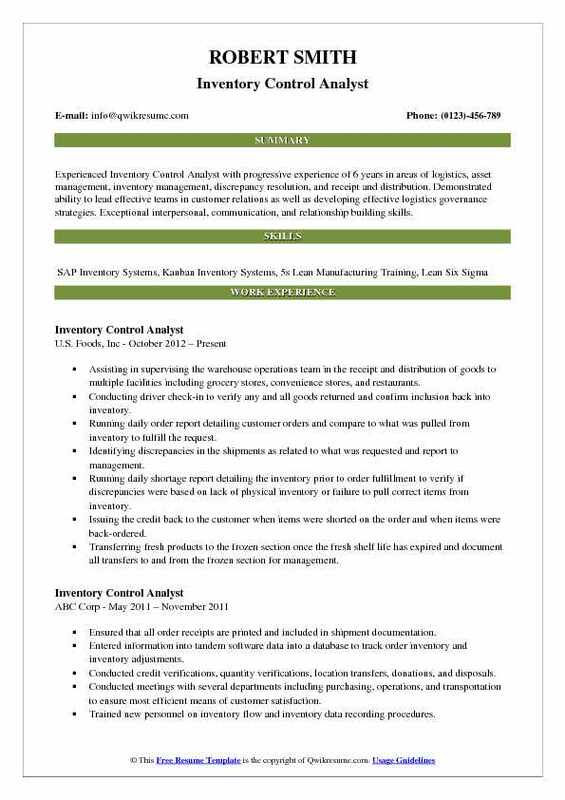 Summary : Inventory Control Analyst with 14 years of experience in inventory control, quality, shipping and receiving, purchasing, and supervision. A dedicated and loyal professional offering a background combined with the following qualifications and experience: Communication to all levels of management, Adherence to quality and accuracy, Team building and leadership, Record of reliability and loyalty in every position held, Willing to work beyond job requirements, Proficient in Oracle applications. Identified and reported on frequent issues that create inventory discrepancies and suggest corrective actions to be implemented to avoid reoccurrences of the problems. Responsibilities included cycle counts and inventory reconciliation for finished goods and inventory. Evaluated existing inventory control procedures and correct them as required. Performed recording for inventory inspection finding and report discrepancies as necessary. Executed supervision methods and demonstrate improved efficiency through their implementation. Performs audits and reviews data from multiple sources to determine the accuracy of inventory records, parts requirements, and delivery schedules and distributes materials management reports to impacted partners for review and immediate action. Making fact-based decisions to improve process efficiency and reduce costs across supply chain functions. 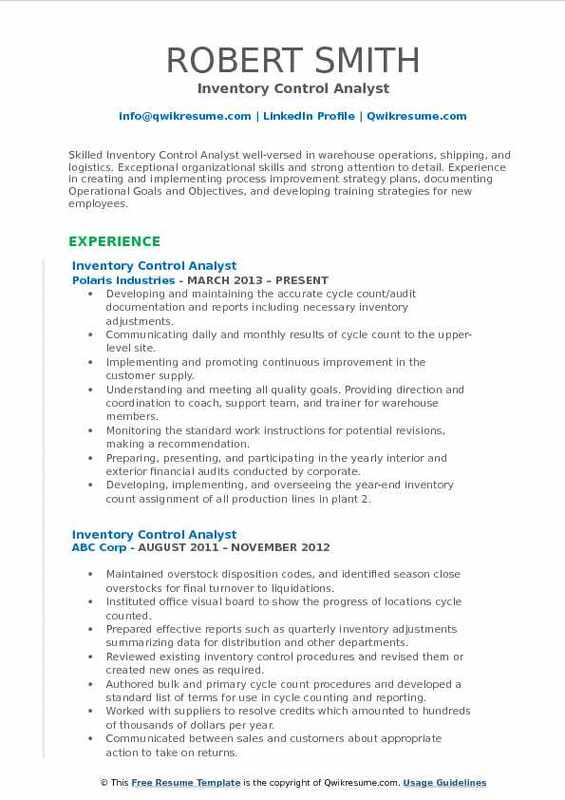 Summary : Service-oriented Inventory Control Analyst I with 11 years background in fast-paced work environments. Core competencies include attention to detail, diligence under pressure, and a fierce work ethic as well as excellent communication and time management skills. Handles tasks with accuracy and efficiency. Reporting daily revenue numbers and maintaining the data in the Sharebuilder data software. Placing and rejecting relevant spots onto the stations broadcast log to ensure maximum revenue. Coordinating with sales personnel in the implementation of make goods and available inventory. Analyzing and reporting the current sellout levels and rates to station management for budget and planning purposes. Supplying initial recommendations for upcoming rate cards and budget projections. Assisting in answering questions of all sales personnel on the wide orbit traffic management system. Publishing broadcast schedules to the company's website, listing services, and phone system. Working with the production department for reordering placement and the follow up on the PO shipping status. Providing the management with updates on status. Reviewing the demand analysis report to analyze sales trends and item performance to adjust future media.